Along with Sky Installation, we also offer as part of our services an Alignment service. Sometimes due to high winds, or because the sky dish has been knocked by a rogue football or the window cleaners ladder you can find that you are experiencing picture break up, picture freeze, pixilation or because your satellite dish is out of alignment you get the dreaded message on your screen “no signal”. What you need then is for the alignment back to its correct position. Also, due to trees growing, over time the picture becomes more and more glitchy to the point where you lose signal altogether. At this point Re Alignment will not work, so either the tree gets trimmed or the satellite dish is moved. To find out if you need an alignment service we need to test and check your system first to rule out any other problems, such as LNB faults etc. Often we have to move a dish, and we provide satellite dish installation for customers who need it moving to a new position or a full dish installation for other TV broadcasting systems such as Freesat or Foreign/European TV. We can provide a Discreet installation where we will install the dish in a place which is hidden from view, then we will run the cable in such a way as to hide as much of it as possible. Ask about this service when you book your installation. Sky will not provide a discreet installation, and for that reason many people book our services to carry out this for them. Another reason why we are used for sky installation is because the sky engineer is restricted on the height & position of where the dish will be fit. With Sky a waiting time of approx 2-3 weeks before you get such things as dish alignment or repairs or even installation. DigiTec will get to you if not that day then usually the following day. However, we always aim to fit in with you. 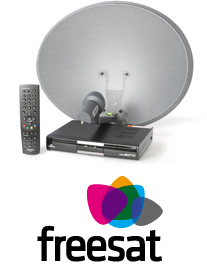 We offer a Freesat installation if you are interested in a free to air satellite TV system. If you already have sky but are wanting to leave, then Freesat is a good alternative. Freesat has HD channels too, and with over 200 channels it's is a good choice. To receive Freesat a Satellite Dish is required, so if you don’t already have an existing Sky dish in good order, then a Freesat Installation of a new sat dish is needed. The receivers vary in price, and can be bought online or we can provide the digibox for you. For any Sky, Freesat or foreign satellite installation, alignment, or any repairs, please feel free to call us to discuss your requirements.